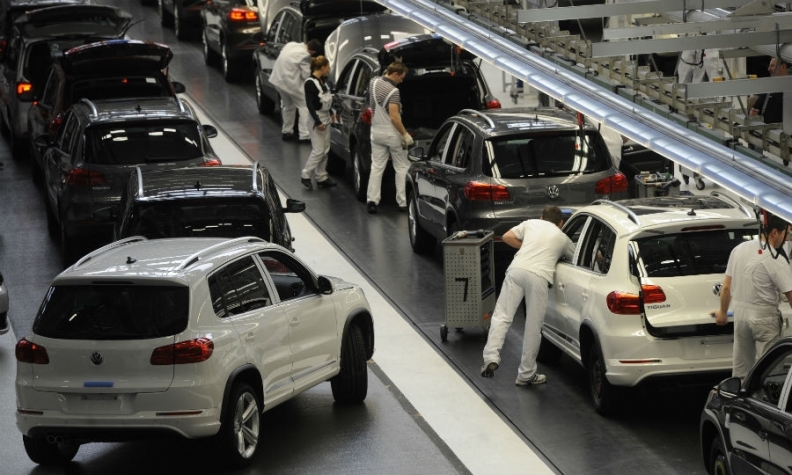 Reducing parts variety on models such as the Tiguan, pictured here at VW's Wolfsburg plant, will cut costs. FRANKFURT (Bloomberg) -- Volkswagen Group plans to boost profitability by scaling back the range of components at its core VW auto brand as a cost-cutting measure. Reducing the variety of parts used in VW vehicles such as the Golf and Polo hatchbacks will offer "significant savings potential," Chief Financial Officer Hans Dieter Poetsch said in an online presentation. VW also indicated that it met last year's earnings goals. Volkswagen delivered a record 10.14 million vehicles in 2014 across all its group brands, which include Audi, Porsche, Bentley, Skoda and Seat. VW brand deliveries last year rose 3 percent to 6.12 million. VW Group reached the 10 million milestone four years earlier than targeted to keep its rank as world's second-largest automaker, behind Toyota Motor Corp. Restoring margins at VW's passenger-car unit, the largest division by volume, is part of a push for the manufacturer to reach a 2018 group profitability target. "We see this as a positive step taken by the group to provide more clarity behind the path to re-rate the margins," Jose Asumendi, an analyst at JPMorgan Chase & Co., said in a report to clients. Poetsch said in the presentation that lowering the number of battery and interior-lamp models used in the current Golf by about half will help slash costs. Cutting engine and gearbox variants for the next version of the Polo by 30 percent is set to improve costs versus the car's previous generations. The company is "well on track" to reach goals in three years after meeting 2014 group targets, which included revenue moving by 3 percent around the previous year's level and an operating margin of 5.5 percent to 6.5 percent of sales, Poetsch said. The VW nameplate has a target of lifting earnings by 5 billion euros ($5.8 billion) by 2017, with operating profit almost tripling to at least 6 percent of revenue by 2018 from 2.3 percent in the first nine months of 2014. Groupwide,VW has a goal of pretax profit exceeding 8 percent of revenue. That margin was 7.8 percent in the nine-month period. The effort includes capping spending increases and boosting revenue while investing about 17 billion euros a year on average through 2019 across the group on new vehicles, technology and factory expansion. Spokesman Marco Dalan declined to comment on a Manager Magazin report earlier today saying VW's new holding company for heavy-truck operations will be structured in a way that would allow a separate share sale should it need additional funding. The new division will probably be based in Frankfurt, according to the report.